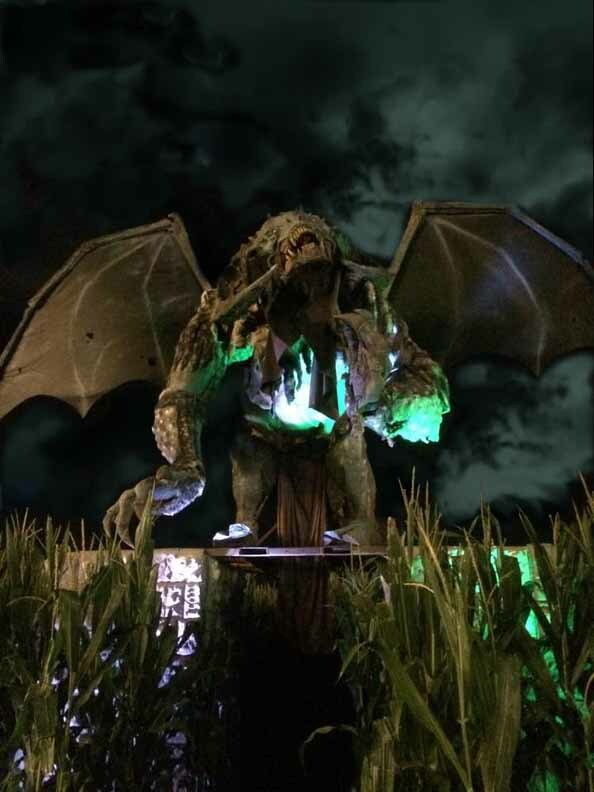 A winged demon guards the entrance of Creatures of the Corn at Fright Fair. Somewhere between the heavyweight theme parks and the welterweight single-maze attractions lies a nebulous zone that is the Halloween equivalent of boxing's Super Middleweight division. 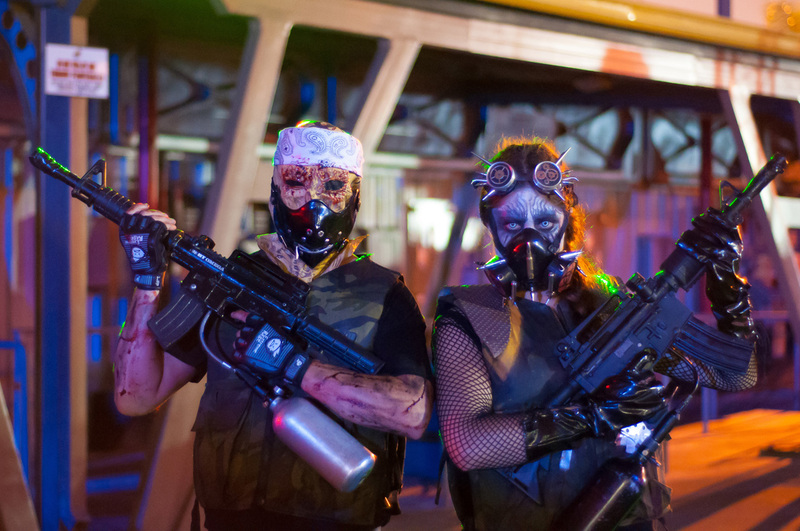 Here we find multi-maze attractions that offer a full evening's worth of entertainment, including not only walk-through horrors but also some combination of stage shows, scare zones, rides, games, and possibly even zombie shooting galleries. During the course of the past ten years, Halloween entertainment seemed to be trending in this direction, no doubt because it offered purveyors an opportunity to make more money. Why charge only $10 for a single walk-through when you can charge $10 each for 3 (with a generous 3-for-$25 discount)? Unfortunately, many of these attractions seemed stretched a bit thin, as if they were offering the same number of scares divided among two, three, or four different mazes; consequently, many of them have faded into oblivion, sometimes after only a season or two: Haunts USA; Paranoia Haunted Attraction; the Thousand Oaks Haunted House; Spooky House; and a trio of attractions that haunted the Pomona Fairgrounds at one time or another: Fearplex, Scareplex, Nightmare at Scareview Farms. Even the fondly remembered Seaside Haunt underwent a form of cellular division, splitting into two walk-throughs for its final season; unfortunately, the process was closer to Neiosis than Mitosis, with about half the genetic material appropriated to each haunted house. However, several of these multi-maze attractions remained in business for Halloween 2014, packing enough monsters and mayhem to keep you screaming all night long. These we celebrate in this category. Note: Hollywood Gothique did not make it out to Riverside for Crossroads Haunted Village or Field of Screams; we apologize and promise to put them up for consideration next year. This perennial favorite offered three memorable mazes (the Factory of Nightmares Haunted House; the Creatures of the Corn Trail; and Insane Reaction Maze, a literal maze), all of which had been seen before but which continue to impress. For Halloween 2014, the Factory of Nightmares was upgraded with some new decor, and Insane Reaction was augmented with the haunt's famous gargantuan Tesla Coil (which had been in mothballs more often than not in recent years). 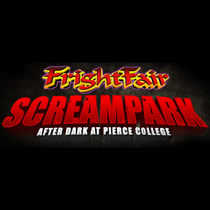 As always, FrightFair's strength was two-fold: first, the cast was uniformly aggressive in their scare tactics; second, the attraction felt like more than the sum of its parts, because the three walk-through attractions were totally different in tone. Unlike the defunct multi-maze attractions mentioned above, FrightFair never left you feeling as if you were seeing the same thing three times over. In its third year, this sporting variation on a Halloween theme offered not only walk-through mazes but zombie shooting galleries that allowed visitors to turn the tables on their attackers. As if that were not enough, there was also a variety of entertainment on stage (magicians, music, etc. 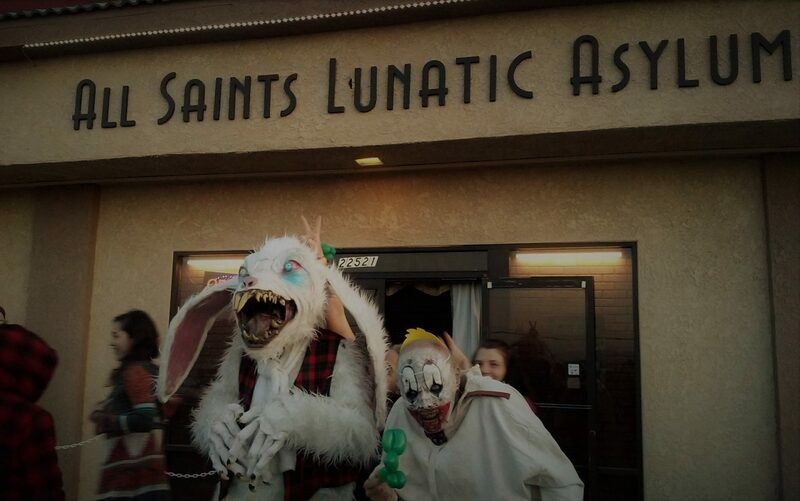 ), and from one weekend to the next, the haunt hosted a variety of special events (such as the Vampire Masquerade). Haunted Hollywood Sports still feels a little like a growing attraction that is finding its way with its mazes and monsters, but the Zombie Killhouses set them apart from the competition, delivering a different sort of thrill. 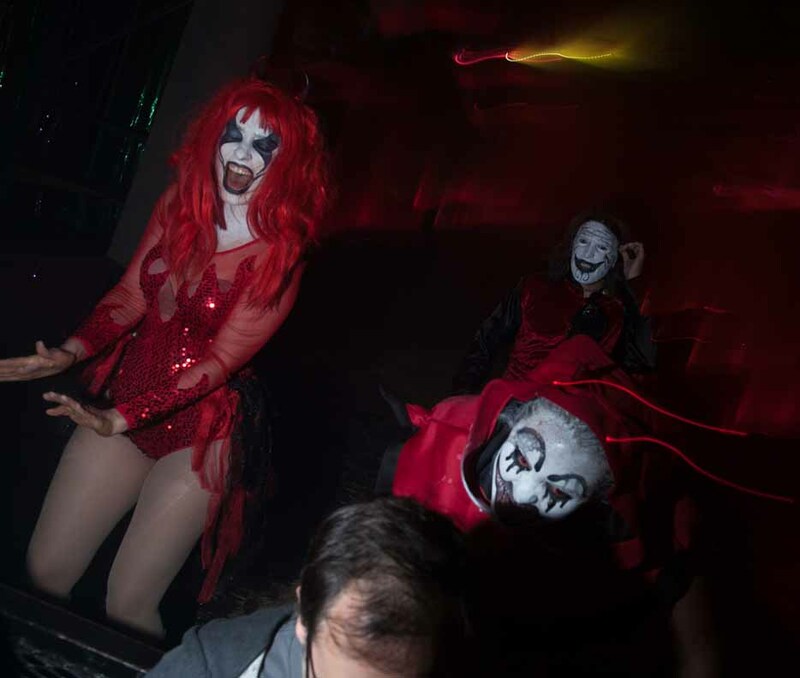 Named after its star attraction, this multi-maze event also included a scare zone, stage entertainment, the long-running In-Between Dark Maze, and - new for this year - two walk-through entertainments: the Seven Sins Sideshow and House of the Horsemen. In what was a fairly unique approach, there was an attempt to maintain a consistent theme throughout: "Echoes from the Rift" portrayed Hell erupting onto Earth, with myriad devils and demons haunting not only the hayride's trail through Griffith Park but also the scare zone and the tents housing the Seven Sins and the Four Horsemen of the Apocalypse. The Los Angeles Haunted Haryride presented this hellish extravaganza with all the elaborate production values one could wish, rivaling Universal Studios Hollywood in terms of elaborate makeup and monsters.